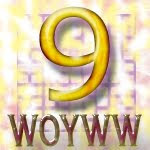 Our middle granddaughter's birthday is coming up fast and I hope to have the card in the mail this week. She is a dancer, as is her younger sister, and does all forms of dance, even ballet with point shoes (tippy toes). I had to get this stamp set to make a special card for her. I used numerous products to make this and love how it turned out. 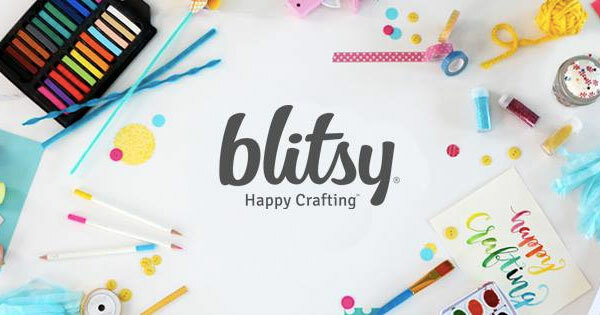 I started with a base of Catalina Splash card stock and embossed it with our Love Letter embossing folder (a Bloom Benefit freebie for a $100 order). 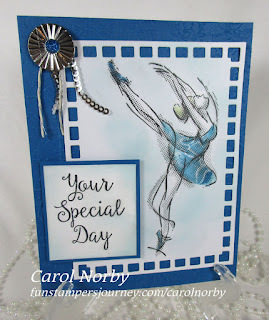 Next I used our cool Film Frame Die Set on Whip Cream card stock to make the piece for the Dancer. 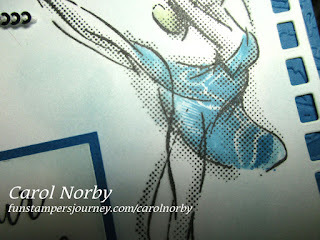 I stamped the Dancer from our Dance Life set using Black Licorice ink and stamped another on a piece of scrap paper. I cut out just the dress from the scrap paper dancer to make a mask. 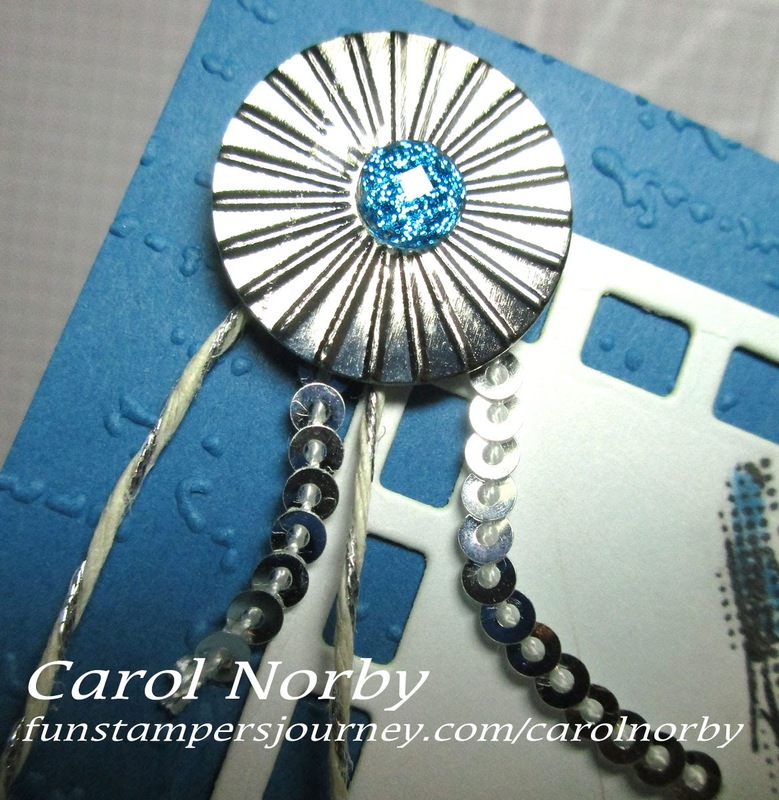 After laying the mask over my image I stamped the small rose from the Embroidered Rose set using Catalina Splash ink. You can see the lines forming the rose in her dress. I used our small Blending Brush and picked up a bit of color from the ink pad to fill in where the stamp missed on her dress and her ballet slippers. Next I used a sponge and more Catalina Splash ink to color around her. Before adding the gorgeous Metal Accent (retired) I used our Stapler and Brushed Silver staples to add a bit of Silver Thread and silver Twinkle Trim to the corner for a touch of bling. A Foam Square attached the Accent and since I didn't have a brad I wanted to use I added the small blue dot from our Summer Play Sparkles. I stamped the text using Black Licorice ink from the Dance Life set on another piece of Whip Cream c.s, and sponged more Catalina Splash ink around it before using Foam Squares to adhere it to a piece of Catalina Splash c.s. Inside I stamped our cool You Are ATS stamp. I also used the Amaze machine and Easy Glide Runner. I think she'll like this card, what do you think? 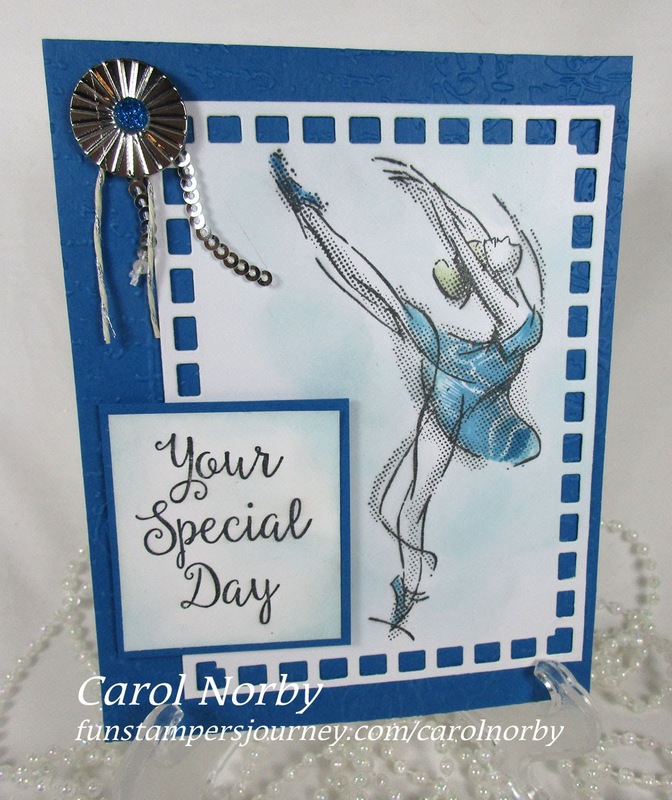 Love the card, Carol! Did you mask around the dress so the rose would stamp only where the dress is? 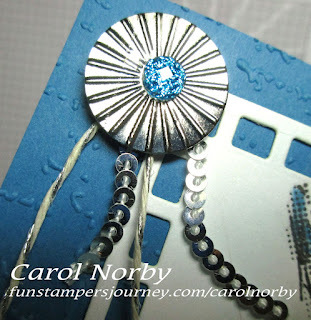 Or did you cut out the dress after stamping over it with the rose and then paper piece it on?